Operated by the Hackensack Meadowlands Development Commission, this great facility features, among other things, the famous Trash Museum, and a long network of boardwalks winding through the cattails and salt marsh of the Meadowlands. Beginning with the main lobby of the building, visitors will find a 30' x 7' diorama depicting an Urban Salt Marsh. The 1,000 gallon brackish creek includes live animals, such as grass shrimp, diamondback terrapin, snapping turtles, fiddler, mud and blue crabs, and others common to these waters. Mounted mammal and bird specimens complete this exhibit which emphasizes the importance of the wetlands. A Bird Watcher's Bulletin tells about the most recent sightings of area birds. More than 200 species have been sighted in this area, a vital migratory rest stop for thousands of ducks, geese, and shorebirds. Another main gallery features Creative Displays which involve visitors in understanding environmental problems, particularly the trash crisis. Interactive exhibits include How Far Does Your Trash Travel?, Where Does Garbage Come From?, Products Made From Recycled Materials, and The Ideal Town. A computer station offers learning games about the environment. A third gallery features a History Exhibit, reflecting on the important events in the growth and development of the Meadowlands. The glass - enclosed Visitor's Center extends out into the marsh to offer a panoramic view, perfect for viewing wildlife feeding and resting in the water below. The Boardwalk Trail offers a quiet stroll through the mist and the reeds. It's quite beautiful and offers great opportunities for photographers, bird watchers, and nature - lovers. As well as being a great place for a family visit, the Center offers great School Programs for grades 1 through 12 and for College Groups, too. Incredible Insects (grades 1 - 3): shows students the characteristics that make insects so successful, and what distinguishes them from other animals. 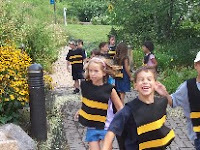 Students collect insects in the marsh, examine them, and release them. Ecology of an Estuary (grades 2 - 12): a participatory slide show, combines with a trip into the marsh to cover the topics of tidal action, animal adaptations, food chains, and human impacts on the wetlands. Paws and Claws (grades 3 - 5): students search for tracks outside. Inside, they use replica animal feet and ink stamps to create believable scenes of wildlife activity, learning about adaptations. Wonderful Wetlands (grade 8 thru College): is an extended introduction to New Jersey's wetlands and their resources. This outdoor program is 4 hours long and is limited to 14 participants. Most other programs last about 90 minutes and can accommodate a larger class. 1 adult per 15 students is required. Many other programs cover various aspects of the wetlands and waste management. Programs are also offered for Scout Groups. In addition, the widely acclaimed Museum Store offers books, educational games, a Teachers' Corner, birding supplies, Native American items, and a selection of unique gift items for the adult visitor, all with a nature and preservation theme. Hours: Museum open weekdays, 9am - 5pm and Saturdays, 10am - 3pm. Admission: Age 12 and over: $2.00. Lunch: Bagged lunch may be eaten. Reusable containers are encouraged! Directions: I-95 South. From West Spur take exit 16W, from East Spur take exit 17. Follow Rt. 3 West to Rt. 17 south (Lyndhurst exit). At light (Quality Inn on left) turn left onto Polito Ave. At the end of Polito Ave (stop sign) turn left onto Valley Brook Ave. Go about 1½ miles to end, cross tracks and bear left to HMDC Environment Center.